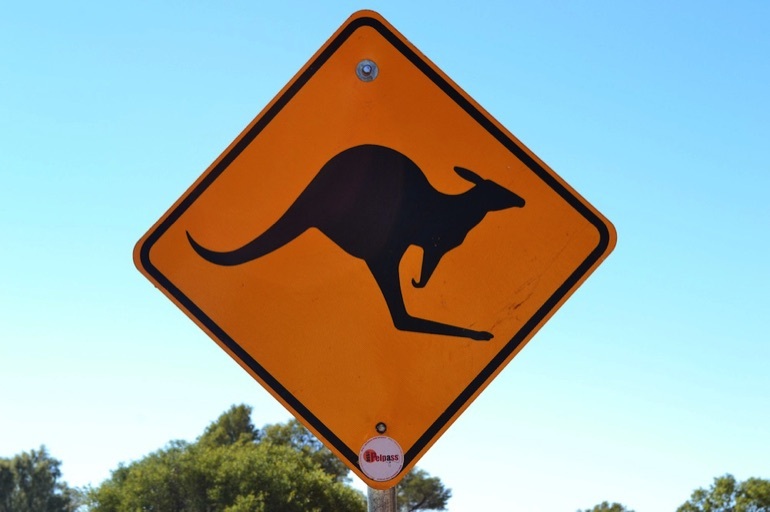 The wonderful world of Australian road signs – and eight places you might see both the signs and the wildlife! Many visitors to Australia think that trees across the country will be dripping with koalas – but, in truth, these cuddly creatures are quite hard to spot. For an almost guaranteed sighting, take a drive along the Great Ocean Road in Victoria. Two prime koala-spotting locations here are Kennet River, and along the road to Cape Otway Lighthouse. You may also see koalas on Magnetic Island, in Queensland. 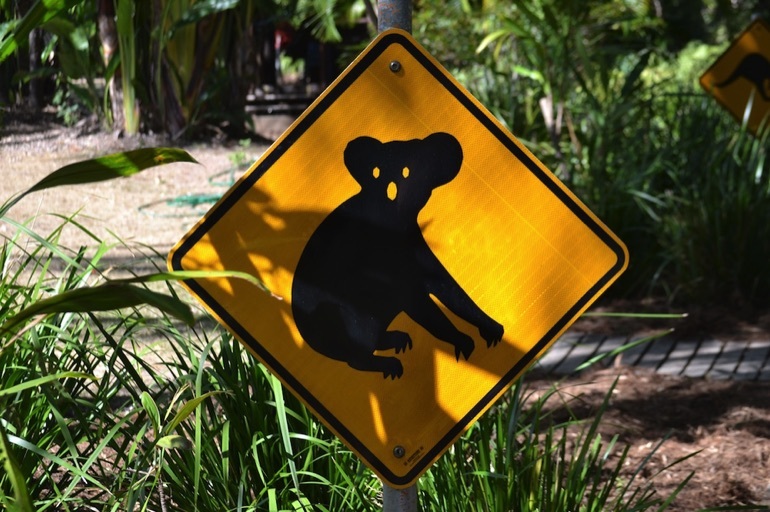 Drive carefully when you see this sign – although koalas spend most of their time in eucalyptus trees, sleeping or eating leaves, they do sometimes cross the road. Ubiquitous across most of Australia, you'll see kangaroo warning signs pretty much everywhere. Well-known places to spot roos include Kangaroo Island (of course) in South Australia and Pebbly Beach at Batemans Bay in New South Wales, where they congregate on the beach at sundown. Kangaroos are most active at dusk and dawn, so you need to take extra care when driving at these times. 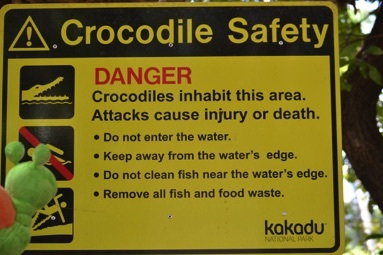 You'll see crocodile warning signs like these all over Kakadu National Park in the Northern Territory. There are two types of croc in Australia: saltwater (salties) and freshwater. It's the salties that want to eat you for lunch – so if you see a warning sign, don't even think about going for a swim. In fact stay well back from the water. 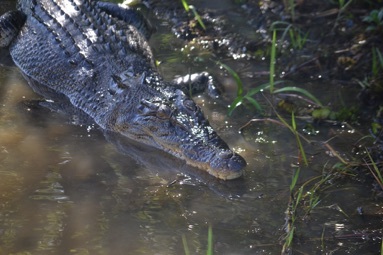 To see crocodiles safely, take a cruise along Yellow Water Billabong and South Alligator River with Yellow Water Cruises. 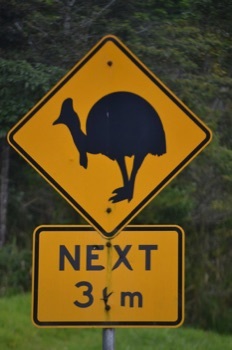 There are only around 4,000 cassowaries left in the world – so if you see this sign, be sure to drive extremely carefully so as not to reduce the population even further. 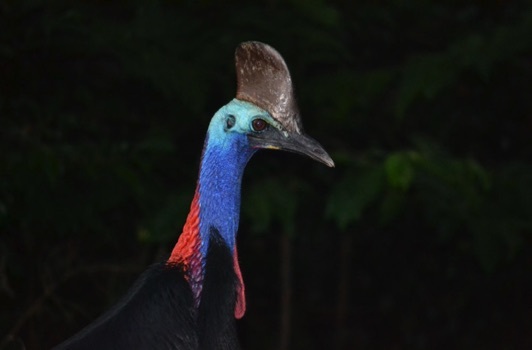 Mission Beach, in North Queensland, has one of the highest numbers of cassowaries – so this is a good place to head for to see this extraordinary looking bird. If you do see one, admire it from afar – they can be dangerous if they feel threatened. Wallabies look a lot like kangaroos – except they are much smaller. 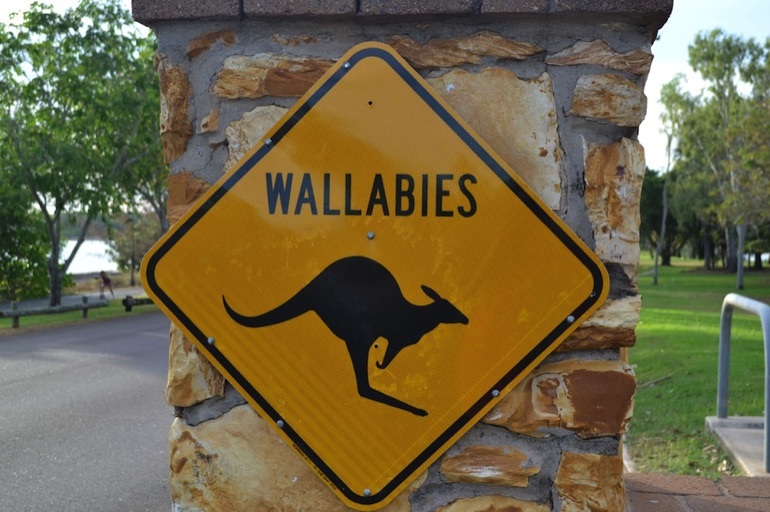 They can be seen all over Australia and there are a number of different wallaby species to look out for. At Bremner Point, on Magnetic Island, there's a large population of rock wallabies that have become used to humans – you can even feed them (they particularly like carrots and apples). Stonefish are nasty little blighters. A stonefish can make itself look just like a rock so that you can't see it. Then when you step on it, it shoots poisonous venom into your foot via the sharp spines on its back. 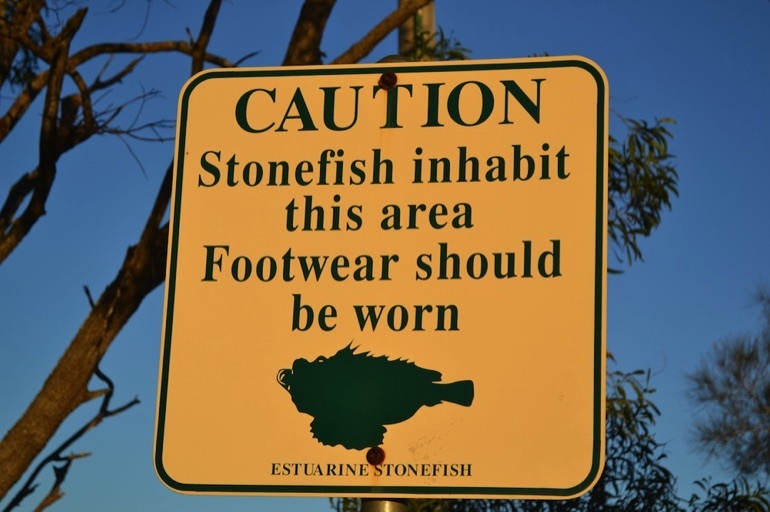 Don't step on a stonefish. Heed the warning signs. While the animals on many Australian warning signs are instantly recognisable, this one may not be so familiar. It's a tree kangaroo. 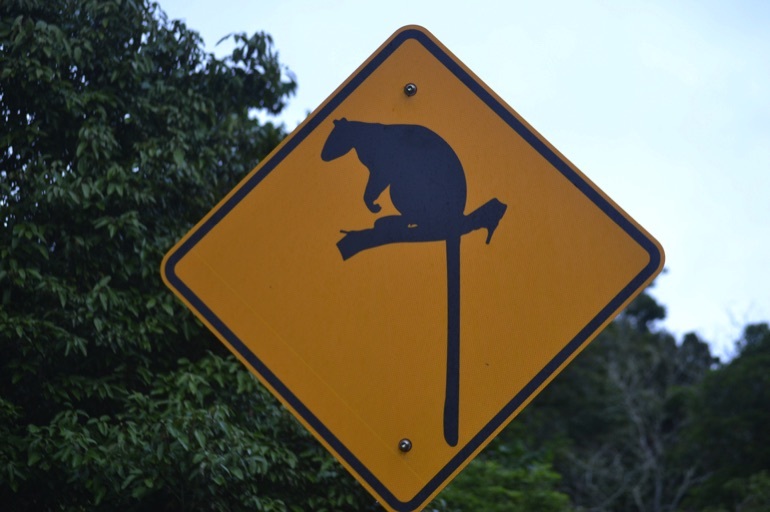 These signs are quite common in the Atherton Tablelands region of Queensland – but if you see an actual tree kangaroo, count yourself very lucky indeed. They're very rare and extremely shy. We've been fortunate enough to have two sightings: in the Curtain Fig National Park, and at Peterson Creek near Yungaburra. 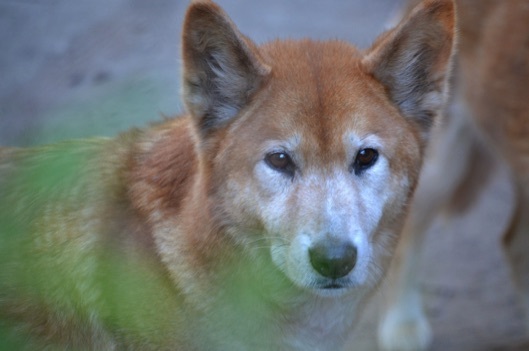 While they may look just like a pet dog, dingoes are wild animals and can be unpredictable and dangerous – especially if they feel threatened. 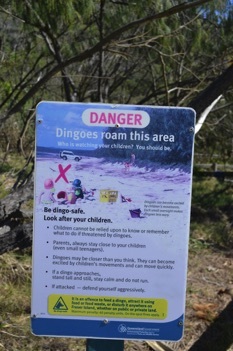 Fraser Island, off the southern coast of Queensland, is home to a large dingo population – and you'll see these signs dotted all over the island. Attacks on humans are rare, but stay safe by walking in groups and keeping a close eye on children at all times. And don't ever feed them – it's illegal.